Before you shoot your footage you need to think about the editing. The GoPro Fusion output can make people have motion sickness if you are not careful. To show the two main types of rendering I have made a short video. 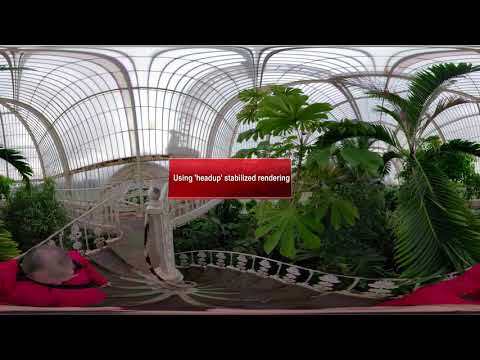 This was part of a longer video of Kew Gardens in London. Going down a spiral staircase in 360 video could cause the viewer to have to rotate around and around using full stabilization. By keeping the GoPro Fusion upright and pointing in the direction of motion then using Anti-shake stabilization you can direct the viewers direction of looking and avoid them having to rotate. This can also be done in a video editing program but would take some time although I do use this process quite often as well. Keeping the original footage so the rendering can be re-rendered if needed in another mode does use my hard disc space up but it can make the editing easier if you find you need another type of stabilization in a shot.